2010-06-16 First worldwide family litigation filed litigation Critical https://patents.darts-ip.com/?family=22624773&utm_source=google_patent&utm_medium=platform_link&utm_campaign=public_patent_search&patent=EP1255536(B1) "Global patent litigation dataset” by Darts-ip is licensed under a Creative Commons Attribution 4.0 International License. 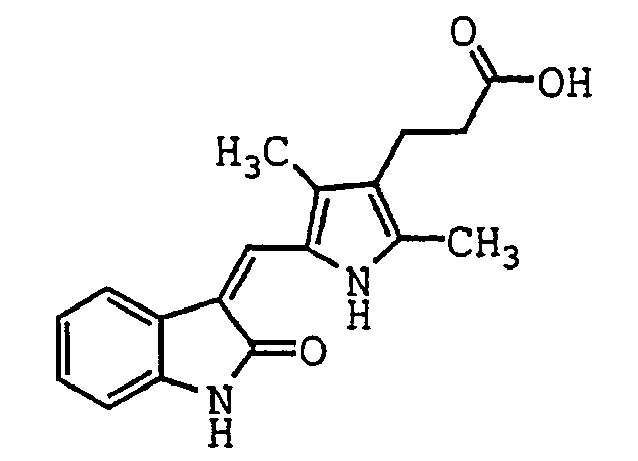 The present invention concerns compounds and their use to inhibit the activity of a receptor tyrosine kinase. The invention is preferably used to treat cell proliferative disorders such as cancers characterized by over-activity or inappropriate activity <i>c-kit</i> kinase. The present invention relates to the use of compounds, and compositions for inhibiting cell proliferative disorders. The invention is particularly useful for inhibiting cell proliferative disorders characterized by overactivity and/or inappropriate activity of a c-kit kinase. The following description of the background of the invention is provided to aid in understanding the invention, but is not admitted to describe or constitute prior art to the invention. Kit signaling is critical for fetal gonadal development, and continues to play a role in adult fertility (Mauduit et al. (1999) Human Reproduction Update 5:535-545). Spermatogenesis is inhibited in the absence of SCF (Ohta et al. (2000) Development 127:2125-2131) or the ability of Kit to signal through the PI3 kinase pathway (Blume-Jensen et al. (2000) Nature Genetics 24:157-162; Kissel et al. (2000) EMBO Journal 19:1312-1326). Kit expression has also been observed to be lower in sub-fertile testes than in normal testicular tissue (Feng et al. (1999) Fertility & Sterility 71:85-89). Kit signaling is also important for oogenesis and folliculogenesis (Parrott & Skinner (1999) Endocrinology 140:4262-4271; Driancourt et al. (2000) Reviews of Reproduction 5:143-152). These observations suggest that Kit kinase inhibitors would reduce both male and female fertility. As a key mediator of mast cell function, Kit may play a role in pathologies associated with mast cells. For example, mast cells have been associated with interstitial fibrosis in chronic rejection of human renal allografts (Pardo et al. (2000) Virchows Archiv 437:167-172). Mast cells have also been implicated in liver allograft rejection (Yamaguchi et al. (1999) Hepatology 29:133-139) and in liver fibrosis, where hepatic stellate cells produce the SCF that recruits the mast cells (Gaca et al. (1999) J. Hepatology 30:850-858). These observations suggest the Kit kinase inhibitors may help prevent organ rejection and fibrosis. Mast cells have also been implicated in the pathology of multiple sclerosis (Secor et al. (2000) J. Experimental Medicine 191:813-822) and ischemia-reperfusion injury (Andoh et al. (1999) Clinical & Experimental Immunology 116:90-93) in experimental models using mice with mutant Kit receptors that are deficient in mast cells. In both cases, the pathology of the disease was significantly attenuated relative to mice with normal Kit and mast cells populations. Thus, the role of mast cells in these diseases suggests that Kit kinase inhibitors might be useful therapeutics. Cellular signal transduction is a fundamental mechanism whereby extracellular stimuli are relayed to the interior of cells and subsequently regulate diverse cellular processes. One of the key biochemical mechanisms of signal transduction involves the reversible phosphorylation of proteins. Phosphorylation of polypeptides regulates the activity of mature proteins by altering their structure and function. Phosphate most often resides on the hydroxyl moiety (-OH) of serine, threonine, or tyrosine amino acids in proteins. Enzymes that mediate phosphorylation of cellular effectors generally fall into two classes. The first class consists of protein kinases which transfer a phosphate moiety from adenosine triphosphate to protein substrates. The second class consists of protein phosphatases which hydrolyze phosphate moieties from phosphoryl protein substrates. The converse functions of protein kinases and protein phosphatases balance and regulate the flow of signals in signal transduction processes. Protein kinases and protein phosphatases are generally divided into two groups: receptor and non-receptor type proteins. Most receptor-type protein tyrosine phosphatases contain two conserved catalytic domains, each of which encompasses a segment of 240 amino acid residues. Saito, et al., 1991, Cell Growth and Diff. 2:59-65. Receptor protein tyrosine phosphatases can be subclassified further based upon the amino acid sequence diversity of their extracellular domains. Saito, et al., supra; Krueger, et al., 1992, Proc. Natl. Acad. Sci. USA 89:7417-7421. Protein kinases and protein phosphatases are also typically divided into three classes based upon the amino acids they act upon. Some catalyze the addition or hydrolysis of phosphate on serine or threonine only, some catalyze the addition or hydrolysis of phosphate on tyrosine only, and some catalyze the addition or hydrolysis of phosphate on serine, threonine, and tyrosine. Tyrosine kinases can regulate the catalytic activity of other protein kinases involved in cell proliferation. Protein kinases with inappropriate activity are also involved in some types of cancer. Abnormally elevated levels of cell proliferation are associated with receptor and non-receptor protein kinases with unregulated activity. In addition to their role in cellular proliferation, protein kinases are thought to be involved in cellular differentiation processes. Cell differentiation occurs in some cells upon nerve growth factor (NGF) or epidermal growth factor (EGF) stimulation. Cellular differentiation is characterized by rapid membrane ruffling, cell flattening, and increases in cell adhesion. (Chao, 1992, Cell 68:995-997). In an effort to discover novel treatments for cancer and other diseases, biomedical researchers and chemists have designed, synthesized, and tested molecules that inhibit the function of protein kinases. Some small organic molecules form a class of compounds that modulate the function of protein kinases. Examples of molecules that have been reported to inhibit the function of protein kinases are bis-monocyclic, bicyclic or heterocyclic aryl compounds (PCT WO 92/20642), vinylene-azaindole derivatives (PCT WO 94/14808), 1-cyclopropyl-4-pyridyl-quinolones (U.S. Patent No. 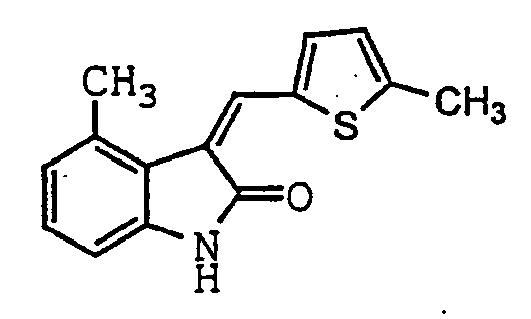 5,330,992), styryl compounds (by Levitzki, et al., U.S. Patent No. 5,217,999, and entitled "Styryl Compounds which Inhibit EGF Receptor Protein Tyrosine Kinase, Lyon & Lyon Docket No. 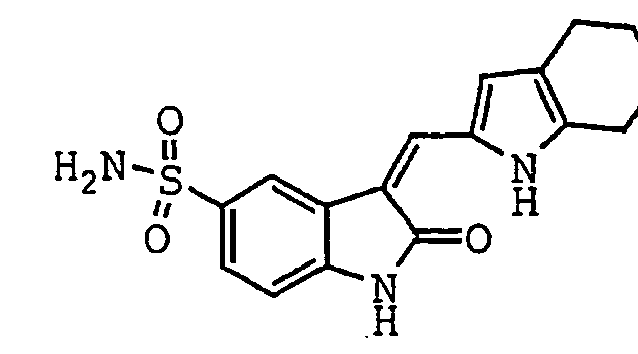 208/050), styryl-substituted pyridyl compounds (U.S. Patent No. 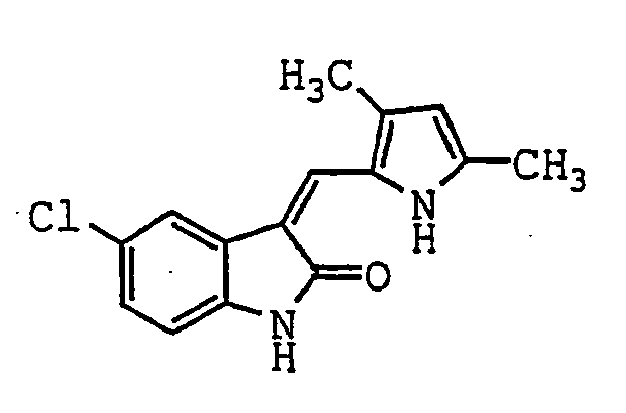 5,302,606), certain quinazoline derivatives (EP Application No. 0 566 266 A1), seleoindoles and selenides (PCT WO 94/03427), tricyclic polyhydroxylic compounds (PCT WO 92/21660), and benzylphosphonic acid compounds (PCT WO 91/15495). The compounds that can traverse cell membranes and are resistant to acid hydrolysis are potentially advantageous therapeutics as they can become highly bioavailable after being administered orally to patients. However, many of these protein kinase inhibitors only weakly inhibit the function of protein kinases. In addition, many inhibit a variety of protein kinases and will therefore cause multiple side-effects as therapeutics for diseases. Despite the significant progress that has been made in developing compounds for the treatment of cancer, there remains a need in the art to identify the particular structures and substitution patterns that form the compounds capable of modulating the function of particular protein kinases. The present invention is directed towards the use of indolinone compounds for modulating the function of protein kinases with these compounds. The present invention features indolinone compounds that potently inhibit receptor protein kinases of the c-kit family and related products and methods. Other inhibitors and/or activators of c-kit protein kinases can be obtained by adding chemical substituents to an unsubstituted indolinone compound (See Formulas I and II, below). The compounds as used in the invention provide therapeutics and/or prophylactics for diseases associated with one or more functional c-kit protein kinases. Certain types of cancer fall into this class of diseases, along with certain immune disorders associated with the over-production or over-stimulation of mast cells. The compounds can be modified such that they are specific to their target or targets and will subsequently cause few side effects. These properties are significant improvements over the currently utilized cancer therapeutics that cause multiple side effects and deleteriously weaken patients. The compounds used in the invention will minimize or obliterate certain types of solid tumors and leukemias by inhibiting the activity of the c-kit receptor protein kinases, or will at least modulate or inhibit tumor growth and/or metastases. Certain types of cancer, such as Small Cell Lung Cancer (SCLC), express both the c-kit receptor protein kinase and Stem Cell Factor (SCF), a c-kit ligand. While a precise understanding of the mechanism by which compounds inhibit phosphotyrosine kinases (PTKs) (e.g., the c-kit receptor kinase, a transmembrane tyrosine kinase growth factor receptor) is not required in order to practice the present invention, the compounds are believed to interact with the amino acids of the PTKs' catalytic region. PTKs typically possess a bi-lobate structure, and ATP appears to bind in the cleft between the two lobes in a region where the amino acids are conserved among PTKs; inhibitors of PTKs are believed to bind to the PTKs through non-covalent interactions such as hydrogen bonding, Van der Waals interactions, hydrophobic interactions, and ionic bonding, in the same general region that ATP binds to the PTKs. 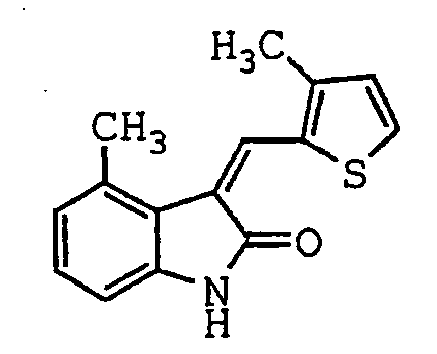 More specifically, it is thought that the oxindole component (See Formula III, below) of the compounds of the present invention binds in the same general space occupied by the adenine ring of ATP. Specificity of a PTK inhibitor for a particular PTK may be conferred by interactions between the constituents around the oxindole core with amino acid domains specific to individual PKs. Thus, different substitutents may contribute to preferential binding to particular PKs. The ability to select those compounds active at different ATP binding sites makes them useful in targeting any protein with such a site, including not only protein tyrosine kinases, but also serine/threonine kinases. Thus, such compounds have utility for in vitro assays on such proteins and for in vivo therapeutic effect through such proteins. For example, as mentioned above, certain types of cancer express both the c-kit receptor protein kinase and Stem Cell Factor (SCF) and this pairing could constitute an autocrine loop stimulating the growth of these cancerous cells. Therefore, inhibition of the c-kit protein kinase could disrupt this autocrine loop and thereby retard tumor growth and/or obliterate tumors via normal mechanisms of apoptosis. Thus, in a first aspect, the invention provides the use as defined in claim 1 for treating or preventing an abnormal condition as defined below in an organism. The abnormal condition is associated with an aberration in a signal transduction pathway mediated by an interaction between a c-kit kinase and a natural binding partner. The composition is administered to the organism a therapeutically effective amount of an indolinone compound. The indolinone compound modulates the interaction between the c-kit kinase and a natural binding partner. Therefore, promoting or disrupting (preferably disrupting) this interaction is predicted to have therapeutic benefits to a given population of patients in need of such treatment. In a preferred embodiment, the amount of signaling through c-kit kinase is abnormal, and the compound promotes or disrupts the signaling. The term "treating" refers to having a therapeutic effect and at least partially alleviating or abrogating an abnormal condition in the organism. The term "treating" preferably refers to ameliorating a symptom of the abnormal condition in a group of patients to whom the indolinone is administered relative to a control group that does not receive the indolinone. The effect of the treatment can be monitored by measuring a change or an absence of a change in cell phenotype, a change or an absence of a change in cell proliferation, a change or an absence of a change in the catalytic activity of this c-kit protein kinase, and a change or an absence of a change in the interaction between this protein kinase and a natural binding partner. The term "treating" or "treatment" does not necessarily mean total cure. Any alleviation of any undesired symptom of the disease to any extent or the slowing down of the progress of the disease can be considered treatment. Furthermore, treatment may include acts which may worsen the patient's overall feeling of well being or appearance. For example, the administration of chemotherapy in cancer patients which may leave the patients feeling "sicker" is still considered treatment. The term "catalytic activity" used above, in the context of the invention, defines the rate at which a protein kinase phosphorylates a substrate. Catalytic activity can be measured, for example, by determining the amount of a substrate converted to a product as a function of time. Phosphorylation of a substrate occurs at the active site of a protein kinase. The active site is normally a cavity in which the substrate binds to the protein kinase and is phosphorylated. The term "substrate" as used above and herein refers to a molecule phosphorylated by a protein kinase. The substrate is preferably a peptide and more preferably a protein. The term "preventing" refers to decreasing the probability that an organism contracts or develops an abnormal condition. The term "preventing" preferably refers to reducing the percentage of individuals who develop the abnormal condition relative to a control group that does not undergo administration of an indolinone. The term "abnormal condition" refers to a function in the cells or tissues of an organism that deviates from its normal functions in that organism. An abnormal condition can relate to cell proliferation, cell differentiation, or cell survival. Abnormal conditions include mastocytosis, the presence of one or more mast cell tumors, asthma, allergy-associated chronic rhinitis, and gastrointestinal stromal tumors. In a preferred embodiment, these abnormal conditions, such as mast cell tumors and mastocytosis, arise in non-human organisms and may thus be prevented or treated during the practice of veterinary medicine. Abnormal cell survival conditions relate to conditions in which programmed cell death (apoptosis) pathways are activated or abrogated. A number of protein kinases are associated with the apoptosis pathways. Aberrations in the function of any one of the protein kinases could lead to cell immortality or premature cell death. The term "function" as used in relation to a protein kinase above refers to the cellular role of a protein kinase, preferably a c-kit kinase. The protein kinase family includes members that regulate many steps in signaling cascades, including cascades controlling cell growth, migration, differentiation, gene expression, muscle contraction, glucose metabolism, cellular protein synthesis, and regulation of the cell cycle. The "function" of a membrane receptor kinase usually is to transduce a signal from outside a cell's membrane to the interior of a cell. To accomplish this it may perform one or all of these other functions: bind a ligand, dimerize to another membrane receptor kinase, phosphorylate other proteins within the cell, bind other proteins within the cell, and cause the localization of proteins within the cell. The term "organism" relates to any living entity comprised of at least one cell. An organism can be as simple as one eukaryotic cell or as complex as a mammal. The organism is preferably a mammal, more preferably a human. The term "mammal" refers preferably to such organisms as mice, rats, rabbits, guinea pigs, sheep, and goats, more preferably to cats, dogs; monkeys, and apes. In preferred embodiments, the abnormal condition associated with mammals may include mastocytosis, and the presence of one or more mast cell tumors. The term "aberration," refers to a protein kinase, e.g., a c-kit kinase that is over- or under-expressed in an organism, mutated such that its catalytic activity is lower or higher than wild-type protein kinase activity, mutated such that it can no longer interact with a natural binding partner, no longer functions in an autocrine loop within the cell, is no longer modified by another protein kinase or protein phosphatase, or no longer interacts with a natural binding partner. Preferably, the aberration involves excessive or deficient signaling upon interaction with a natural binding partner. The term "signal transduction pathway" refers to the molecules that propagate an extracellular signal through the cell membrane to become an intracellular signal. This signal can then stimulate a cellular response. The polypeptide molecules involved in signal transduction processes include receptor and non-receptor protein tyrosine kinases, receptor and non-receptor protein phosphatases, proteins containing SRC homology 2 and 3 domains, phosphotyrosine binding proteins (SRC homology 2 (SH2) and phosphotyrosine binding (PTB and PH) domain containing proteins), proline-rich binding proteins (SH3 domain containing proteins), GTPases, phosphodiesterases, phospholipases, prolyl isomerases, proteases, Ca2+ binding proteins, cAMP binding proteins, guanyl cyclases, adenylyl cyclases, NO generating proteins, nucleotide exchange factors, and transcription factors. The term "mediated" refers to involvement in the control or effect of the interaction between c-kit kinase and the natural binding partners on the aberration in the signal transduction pathway. Thus, the signal transduction pathway that has an aberration and is associated with the abnormal condition, contains a c-kit kinase in interaction with a natural binding partner. The "interaction" of a c-kit kinase molecule is the binding of that c-kit kinase molecule to a natural binding partner or molecule within the cell or the phosphorylation by a c-kit kinase molecule of another protein or molecule within the cell, or any other association of c-kit kinase within a cell. These interactions include non-covalent interactions such as hydrogen bonding, Van der Waals interactions, hydrophobic interactions, and ionic bonding. The term "c-kit kinase" refers to a membrane receptor protein tyrosine kinase which is preferably activated upon binding Stem Cell Factor (SCF) to its extracellular domain (Yarden et al., 1987; Qiu et al., 1988). The receptor tyrosine kinase c-kit kinase contains 5 immunoglobulin-like motifs in the extracellular domain and a cytoplasmic "split" kinase domain, Figure 1. The full length amino acid sequence of a c-kit kinase preferably is as set forth in Yarden, et al., 1987, EMBO J. 11:3341-3351; and Qiu, et al., 1988, EMBO J 7:1003-1011. Mutant versions of c-kit kinase are encompassed by the term "c-kit kinase" and include those that fall into two classes: (1) having a single amino acid substitution at codon 816 of the human c-kit kinase, or its equivalent position in other species (Ma et al., 1999, J. 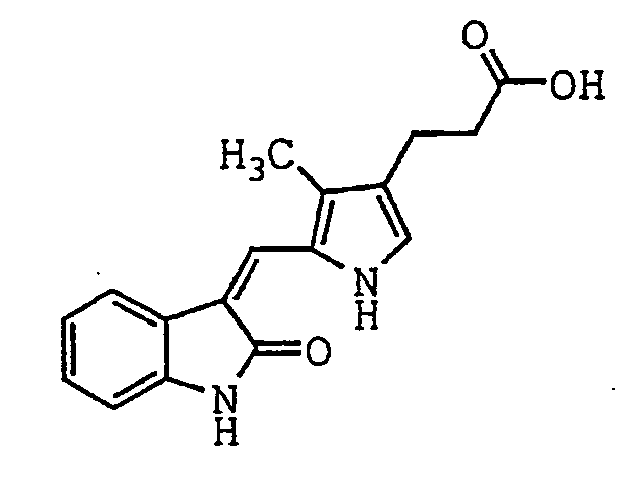 Invest Dermatol 112:165-170), and (2) those which have mutations involving the putative juxtamembrane z-helix of the protein (Ma, et al., 1999, J Biol Chem 274:13399-13402). The term "natural binding partner" refers to a polypeptide or compound such as ATP that binds to a protein kinase in cells. Natural binding partners can play a role in propagating a signal in a protein kinase signal transduction process. A change in the interaction between a protein kinase and a natural binding partner can manifest itself as an increased or decreased probability that the interaction forms, or an increased or decreased concentration of the protein kinase/natural binding partner complex. A "therapeutically effective" amount means an amount of compound effective to prevent, alleviate or ameliorate symptoms of disease or prolong the survival of the subject being treated. Determination of a therapeutically effective amount is well within the capability of those skilled in the art, especially in light of the detailed disclosure provided herein. A "therapeutically effective amount," in reference to the treatment of a cancer refers to an amount sufficient to bring about one or more of the following results: reduce the size of the cancer, inhibit the metastasis of the cancer, inhibit the growth of the cancer, stop the growth of the cancer, relieve discomfort due to the cancer, or prolong the life of a patient inflicted with the cancer. A "therapeutically effective amount", in reference to the treatment of a cell proliferative disorder other than a cancer refers to an amount sufficient to bring about one or more of the following results: inhibit the growth of cells causing the disorder, relieve discomfort due to the disorder, or prolong the life of a patient suffering from the disorder. 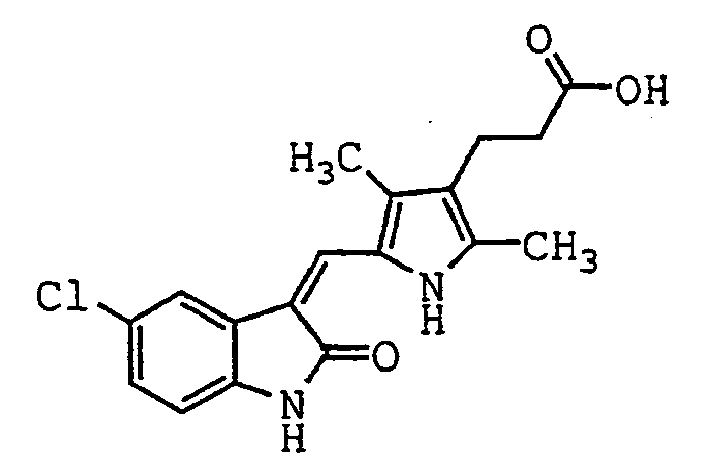 The term "indolinone" is used as that term is commonly understood in the art and includes a large subclass of substituted or unsubstituted compounds that are capable of being synthesized from an aldehyde moiety and an oxindole moiety. In preferred embodiments, the indolinones included in the present method have the structures of Formulas I and II (see below), and more preferably are selected from Compounds One through Thirteen (see below). 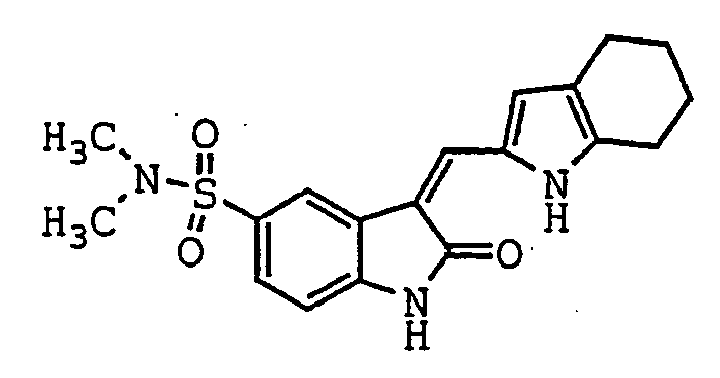 Examples of representative indolinone compounds and the synthesis thereof, are set forth in the following applications: (1) PCT application number US99/06468, filed March 26, 1999 by Fong, et al. and entitled METHODS OF MODULATING TYROSINE PROTEIN KINASE (Lyon & Lyon docket number 231/250 PCT), (2) U.S. Provisional Application No. 60/131,192, filed April 26, 1999 by Tang, et al. and entitled DIARYL INDOLINONE COMPOUNDS AS KINASE INHIBITORS (Lyon & Lyon docket number 239/205), (3) U.S. Provisional Application No. 60/132,243, filed May 3, 1999 by Tang, et al. and entitled SYNTHESIS OF 4-SUBSTITUTED OXINDOLE AND INDOLINONE COMPOUNDS AND THEIR USE IN TREATMENT OF DISEASE (Lyon & Lyon docket number 231/251), (4) U.S. Application No. 09/283,657, filed April 1, 1999 by Tang, et al. and entitled METHODS OF MODULATING TYROSINE PROTEIN KINASE FUNCTION WITH INDOLINONE COMPOUNDS (Lyon & Lyon docket number 241/180), and (5) U.S. Patent No. 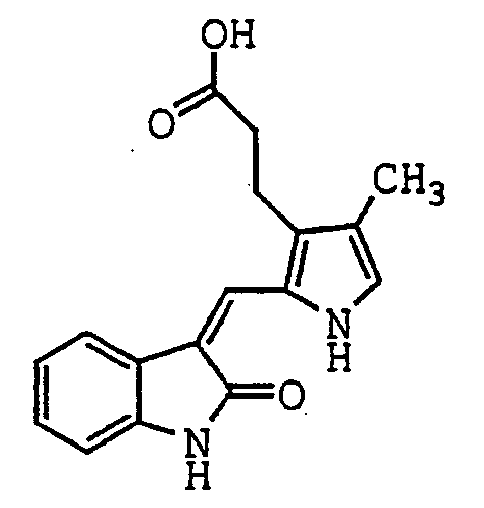 5,792,783, issued August 11, 1998 by Tang et al., entitled 3-HETEROARYL-2-INDOLINONE COMPOUNDS FOR THE TREATMENT OF DISEASE. 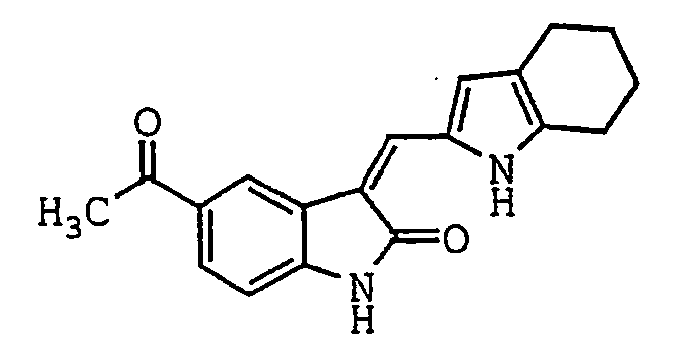 The indolinone compounds used in the invention preferably modulate the activity of the protein tyrosine kinase in vitro. These compounds preferably show positive results in one or more in vitro assays for an activity corresponding to treatment of the disease or disorder in question (such as the assays described in the Examples below). The protein tyrosine kinase which is modulated by the indolinone compounds used in the invention is preferably the c-kit kinase. Examples of the procedures for and the results of such modulation are described in the Examples below. The term "modulates" refers to altering the function of a protein kinase by increasing or decreasing the probability that a complex forms between a protein kinase and a natural binding partner. A modulator preferably increases the probability that such a complex forms between the protein kinase and the natural binding partner, more preferably increases or decreases the probability that a complex forms between the protein kinase and the natural binding partner depending on the concentration of the compound exposed to the protein kinase, and most preferably decreases the probability that a complex forms between the protein kinase and the natural binding partner. A modulator preferably activates the catalytic activity of a protein kinase, more preferably activates or inhibits the catalytic activity of a protein kinase depending on the concentration of the compound exposed to the protein kinase, or most preferably inhibits the catalytic activity of a protein kinase. The term "complex" refers to an assembly of at least two molecules bound to one another. Signal transduction complexes often contain at least two protein molecules bound to one another. The term "activates" refers to increasing the function of a protein kinase. The protein kinase function is preferably the interaction with a natural binding partner and most preferably catalytic activity. The term "inhibit" refers to decreasing the function of a protein kinase. The protein kinase function is preferably the interaction with a natural binding partner and most preferably catalytic activity. A protein kinase's natural binding partner can bind to a protein kinase's extracellular or intracellular region with high affinity. High affinity represents an equilibrium binding constant on the order of 10-6 M or less. In addition, a natural binding partner can also transiently interact with a protein kinase's extracellular or intracellular region and chemically modify it. Protein kinase natural binding partners are chosen from a group that includes, but is not limited to, SRC homology 2 (SH2) or 3 (SH3) domains, other phosphoryl tyrosine binding (PTB) domains, guanine nucleotide exchange factors, protein phosphatases, other protein kinases, and compounds such as ATP. Methods of determining changes in interactions between protein kinases and their natural binding partners are readily available in the art. The term "related to" refers to a disease which has been shown to be accompanied by inappropriate c-kit kinase expression when compared to the same undiseased tissue isolated from an organism. The inappropriate expression can be an elevation of normal activities, a depression of normal activities, or the presence of c-kit kinase activity where none is normally found. The term "in vitro" refers to when the c-kit kinase enzyme is tested outside of a living organism with a compound useful for this invention whereby such compounds are screened for efficaciousness. The term "in vitro" includes the use of tissue culture cells. The term "promotes or disrupts the abnormal interaction" refers to a method that can be accomplished by administering a compound of the invention to cells or tissues in an organism. A compound can promote an interaction between a protein kinase and natural binding partners by forming favorable interactions with multiple atoms at the complex interface. Alternatively, a compound can inhibit an interaction between a protein kinase and natural binding partners by compromising favorable interactions formed between atoms at the complex interface. In preferred embodiments, the promotion or disruption of an abnormal interaction refers to the compound of the invention promoting a conformational change in one of the proteins. Figure 1 is a schematic diagram showing the 5 immunoglobulin-like motifs in the extracellular domain and a cytoplasmic "split" kinase domain of c-kit kinase. The half-loops represent the immunoglobulin-like motifs, and the shaded boxes represent the conserved kinase region of the receptors. Figure 2 shows the effects of indolinone derivatives on the activity of c-kit kinase as measured by ELISA as described in Example 1 in the experimental section. The present invention relates to methods, compounds and compositions capable of regulating and/or modulating cellular signal transduction and, in preferred embodiments, c-kit kinase signal transduction. Receptor kinase-mediated signal transduction is initiated by extracellular interaction with a specific growth factor (ligand), followed by receptor dimerization, transient stimulation of the intrinsic protein kinase activity, and phosphorylation. Binding sites are thereby created for intracellular signal transduction molecules and lead to the formation of complexes with a spectrum of cytoplasmic signaling molecules that facilitate the appropriate cellular response (e.g., cell division, metabolic effects to the extracellular microenvironment). See, Schlessinger and Ullrich, 1992, Neuron 9:303-391. Kinase signal transduction results in, among other responses, cell proliferation, differentiation and metabolism. Abnormal cell proliferation may result in a wide array of disorders and diseases, including the development of neoplasia such as carcinoma, sarcoma, leukemia, glioblastoma, hemangioma, psoriasis, arteriosclerosis, arthritis and diabetic retinopathy (or other disorders related to uncontrolled angiogenesis and/or vasculogenesis). This invention is therefore directed to the use of compounds, and compositions which regulate, modulate and/or inhibit kinase signal transduction by affecting the enzymatic activity of receptor kinases and interfering with the signal transduced by such proteins. More particularly, the present invention is directed to the use of compounds and compositions which regulate, modulate and/or inhibit the c-kit receptor tyrosine kinase as a therapeutic approach to cure many kinds of related diseases. The present invention is therefore directed to the treatment and/or prevention of GIST and those conditions characterized by the overexpression of mast cells, or the inappropriate up-regulation of mast cells, including, but not limited to, mastocytosis, and allergy-associated chronic rhinitis, inflammation and asthma. These conditions are described in greater detail below. I. Target Diseases to be Treated by the Compounds used in the Invention. The compounds described herein are useful for treating disorders related to unregulated kinase signal transduction, including cell proliferative disorders, fibrotic disorders and metabolic disorders. Cell proliferative disorders which can be treated or further studied by the present invention include cancers, and mast cell proliferative disorders. PTKs have been associated with such cell proliferative disorders. For example, some members of the receptor tyrosine kinase (RTK) family have been associated with the development of cancer. Some of these receptors, like the EGFR (Tuzi, et al., 1991, Br. J. Cancer 63:227-233; Torp, et al., 1992, APMIS 100:713-719) HER2/neu (Slamon, et al., 1989, Science 244:707-712) and the PDGF-R (Kumabe, et al., 1992, Oncogene 7:627-633) are overexpressed in many tumors and/or persistently activated by autocrine loops. In fact, in the most common and severe cancers these receptor overexpressions (Akbasak and Suner-Akbasak, et al., 1992, J. Neurol. Sci. 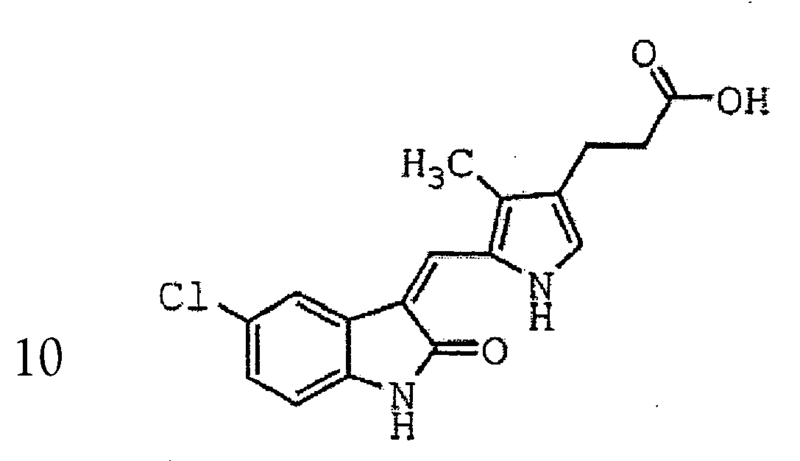 111:119-133; Dickson, et al., 1992, Cancer Treatment Res. 61:249-273; Korc, et al., 1992, J. Clin. Invest. 90:1352-1360) and autocrine loops (Lee and Donnghue, 1992, J. Cell. Biol. 118:1057-1070; Korc, et al., supra; Akbasak and Suner-Akbasak, et al., supra) have been demonstrated. For example, the EGFR receptor has been associated with squamous cell carcinoma, astrocytoma, glioblastoma, head and neck cancer, lung cancer and bladder cancer. HER2 has been associated with breast, ovarian, gastric, lung, pancreas and bladder cancer. The PDGF-R has been associated with glioblastoma, lung, ovarian, melanoma and prostate cancer. The c-kit receptor kinase has been associated with such cell proliferative disorders. For example, the c-kit kinase receptor has been found to be aberrantly expressed in over half the SCLC cells studied along with its ligand SCF (Hibi, et al., 1991, Oncogene 6:2291-2296). Potentially, inhibition of the c-kit kinase will improve the long term survival of patients with SCLC. The presence of c-kit RTK and/or SCF has also been associated with other types of cancers, as described below. The association between abnormalities in RTKs and disease are not restricted to cancer, however. For example, the c-kit Receptor Kinase has been associated with immune diseases such as mastocytosis, asthmas and chronic rhinitis. Excessive activation of c-kit might be associated with diseases resulting from an over-abundance of mast cells. Mastocytosis is the term used to describe a heterogeneous series of disorders characterized by excessive mast cell proliferation (Metcalfe, 1991, J. Invest. Derm 93:2S-4S; Valent, 1996, Wein/Klin Wochenschr 108:385-397; and Golkar, et al., 1997, Lancet 349:1379-1385). Elevated c-kit expression was reported on mast cells from patients with aggressive mastocytosis, but not on mast cells from patients with indolent mastocytosis (Nagata, et al., 1998, Leukemia 12:175-181). Additionally, mast cells and eosinophils represent key cells involved in allergy, inflammation and asthma (Thomas, et al., 1996, Gen. Pharmacol 27:593-597; Metcalfe, et al., 1997, Physiol Rev 77:1033-1079; Holgate, 1997, CIBA Found. Symp. ; Naclerio, et al., 1997, JAMA 278:1842-1848 and Costa, et al., 1997, JAMA 278:1815-1822). SCF, and hence c-kit, directly and indirectly regulates activation of both mast cells and eosinophils, thereby influencing the primary cells involved in allergy and asthma through multiple mechanisms. Because of this mutual regulation of mast cell and eosinophil function, and the role that SCF can play in this regulation, inhibition of c-kit Kinase may provide a means to treat allergy-associated chronic rhinitis, inflammation and asthma. The c-kit kinase plays a critical role in the development ofmelanocytes, mast, germ and hematopoietic cells. The protein encoded by the Sl locus has been called kit ligand (KL), stem cell factor (SCF) or mast cell growth factor (MGF), based on its. biological properties used to identify it (reviewed in Tsujimura, 1996, Pathol Int 46:933-938; Loveland, et al., 1997, J. Endocrinol 153:337-344; Vliagoftis, et al., 1997, Clin Immunol 100:435-440; Broudy, 1997, Blood 90:1345-1364; Pignon, 1997, Hermatol Cell Ther 39:114-116; and Lyman, et al., 1998, Blood 91:1101-1134.). For simplicity, we will use SCF to designate the ligand for the c-kit RTK. SCF is synthesized as a transmembrane protein with a molecular weight of 220 or 248 Dalton, depending on alternative splicing of the mRNA to encode exon 6. The larger protein can be proteolytically cleaved to form a soluble, glycosylated protein which noncovalently dimerizes. Both the soluble and membrane-bound forms of SCF can bind to and activate c-kit. For example, in the skin, SCF is predominantly expressed by fibroblasts, keratinocytes, and endothelial cells, which modulate the activity of melanocytes and mast cells expressing c-kit. In bone, marrow stromal cells express SCF and regulate hematopoiesis of c-kit expressing stem cells. In the gastrointestinal tract, intestinal epithelial cells express SCF and affect the interstitial cells of Cajal and intraepithelial lymphocytes. In the testis, sertoli cells and granulosa cells express SCF which regulates spermatogenesis by interaction with c-kit on germ cells. Aberrant expression and/or activation of c-kit has been implicated in a variety of tumors. Evidence for a contribution of c-kit to neoplastic pathology includes its association with leukemias and mast cell tumors, small cell lung cancer, testicular cancer, and some cancers of the gastrointestinal tract and central nervous system (see below). In addition, c-kit has been implicated in playing a role in carcinogenesis of the female genital tract (Inoue, et al., 1994, Cancer Res. 54(11):3049-3053), sarcomas of neuroectodermal origin (Ricotti, et al., 1998, Blood 91:2397-2405), and Schwann cell neoplasia associated with neurofibromatosis (Ryan, et al., 1994, J. Neuro. Res. 37:415-432). Leukemias: SCF binding to the c-kit RTK protects hematopoietic stem and progenitor cells from apoptosis (Lee, et al., 1997, J. Immunol. 159:3211-3219), thereby contributing to colony formation and hematopoiesis. Expression of c-kit is frequently observed in acute myelocytic leukemia (AML), but is less common in acute lymphocytic leukemia (ALL) (for reviews, see Sperling, et al., 1997, Haemat 82:617-621; Escribano, et al., 1998, Leuk. Lymph. 30:459-466). Although c-kit is expressed in the majority of AML cells, its expression does not appear to be prognostic of disease progression (Sperling, et al., 1997, Haemat 82:617-621). However, SCF protected AML cells from apoptosis induced by chemotherapeutic agents (Hassan, et al., 1996, Acta. Hem. 95:257-262). Inhibition of c-kit by the present invention will enhance the efficacy of these agents and may induce apoptosis of AML cells. The clonal growth of cells from patients with myelodysplastic syndrome (Sawada, et al., 1996, Blood 88:319-327) or chronic myelogenous leukemia (CML) (Sawai, et al., 1996, Exp. Hem. 2:116-122) was found to be significantly enhanced by SCF in combination with other cytokines. CML is characterized by expansion of Philadelphia chromosome positive cells of the marrow (Verfaillie, et al., 1998, Leuk. 12:136-138), which appears to primarily result from inhibition of apoptotic death (Jones, 1997, Curr. Opin. Onc. 9:3-7). The product of the Philadelphia chromosome, p210BCR-ABL, has been reported to mediate inhibition of apoptosis (Bedi, et al., 1995, Blood 86:1148-1158). Since p210BCR-ABL and the c-kit RTK both inhibit apoptosis and p62dok has been suggested as a substrate (Carpino, et al., 1997, Cell 88:197-204), it is possible that clonal expansion mediated by these kinases occurs through a common signaling pathway. However, c-kit has also been reported to interact directly with p210BCR-ABL (Hallek, et al., 1996, Brit. J. Haem. 94:5-16), which suggests that c-kit may have a more causative role in CML pathology. 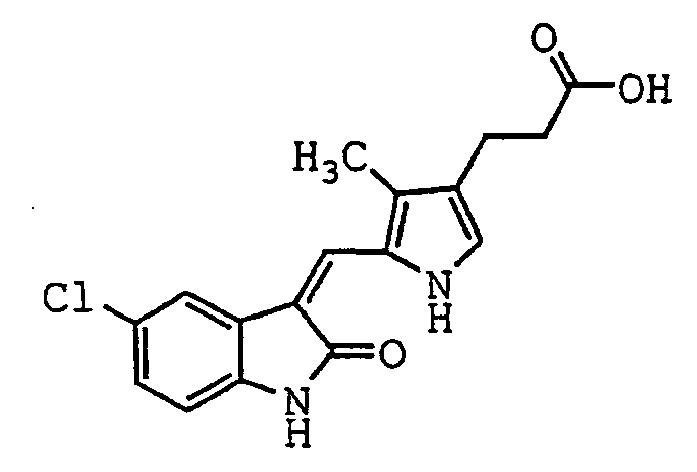 Therefore, inhibition of c-kit kinase will prove useful in the treatment of the above disorders. Gastrointestinal cancers: Normal colorectal mucosa does not express c-kit (Bellone, et al., 1997, J. Cell Physiol. 172:1-11). However, c-kit is frequently expressed in colorectal carcinoma (Bellone, et al., 1997, J. Cell Physiol. 172:1-11), and autocrine loops of SCF and c-kit have been observed in several colon carcinoma cell lines (Toyota, et al., 1993, Turn Biol 14:295-302; Lahm, et al., 1995, Cell Growth & Differ 6:1111-1118; Bellone, et al., 1997, J. Cell Physiol. 172:1-11). Furthermore, disruption of the autocrine loop by the use of neutralizing antibodies (Lahm, et al., 1995, Cell Growth & Differ. 6:1111-1118) and downregulation of c-kit and/or SCF significantly inhibits cell proliferation (Lahm, et al., 1995, Cell Growth & Differ 6:1111-1118; Bellone, et al., 1997, J. Cell Physiol. 172:1-11). SCF/c-kit autocrine loops have been observed in gastric carcinoma cell lines (Turner, et al., 1992, Blood 80:374-381; Hassan, et al., 1998, Digest. Dis. Science 43:8-14), and constitutive c-kit activation also appears to be important for gastrointestinal stromal tumors (GISTs). GISTs are the most common mesenchymal tumor of the digestive system. More than 90% of GISTs express c-kit, which is consistent with the putative origin of these tumor cells from interstitial cells of Cajal (ICCs) (Hirota, et al., 1998, Science 279:577-580). ICCs are thought to regulate contraction of the gastrointestinal tract, and patients lacking c-kit in their ICCs exhibited a myopathic form of chronic idiopathic intestinal pseudo-obstruction (Isozaki, et al., 1997, Amer. J of Gast. 9 332-334). The c-kit expressed in GISTs from several different patients was observed to have mutations in the intracellular juxtamembrane domain leading to constitutive activation of this RTK (Hirota, et al., 1998, Science 279:577-580). Hence, inhibition of c-kit kinase will be an efficacious means for the treatment of these cancers. Testicular cancers: Male germ cell tumors have been histologically categorized into seminomas, which retain germ cell characteristics, and nonseminomas which can display characteristics of embryonal differentiation. Both seminomas and nonseminomas are thought to initiate from a preinvasive stage designated carcinoma in situ (CIS) (Murty, et al., 1998, Sem. Oncol. 25:133-144). Both c-kit and SCF have been reported to be essential for normal gonadal development during embryogenesis (Loveland, et al., 1997, J. Endocrinol 153:337-344). Loss of either the receptor or the ligand resulted in animals devoid of germ cells. In postnatal testes, c-kit has been found to be expressed in Leydig cells and spermatogonia, while SCF was expressed in Sertoli cells (Loveland, et al., 1997, J. Endocrinol 153:337-344). Testicular tumors develop from Leydig cells with high frequency in transgenic mice expressing human papilloma virus 16 (HPV16) E6 and E7 oncogenes (Kondoh, et al., 1991, J. Virol. 65:3335-3339; Kondoh, et al., 1994, J. Urol. 152:2151-2154). These tumors express both c-kit and SCF, and an autocrine loop may contribute to the tumorigenesis (Kondoh, et al., 1995, Oncogene 10:341-347) associated with cellular loss of functional p53 and the retinoblastoma gene product by association with E6 and E7 (Dyson, et al., 1989, Science 243:934-937; Werness, et al., 1990, Science 248:76-79; Scheffner, et al., 1990, Cell 63:1129-1136). Defective signaling mutants of SCF (Kondoh, et al., 1995, Oncogene 10:341-347) or c-kit (Li, et al., 1996, Canc. Res. 56:4343-4346) inhibited formation of testicular tumors in mice expressing HPV16 E6 and E7. The c-kit kinase activation is pivotal to tumorigenesis in these animals and thus modulation of the c-kit kinase pathway by the present invention will prevent or treat such disorders. Expression of c-kit on germ cell tumors shows that the receptor is expressed by the majority of carcinomas in situ and seminomas, but c-kit is expressed in only a minority of nonseminomas (Strohmeyer, et al., 1991, Canc. Res. 51:1811-1816; Rajpert-de Meyts, et al., 1994, Int. J. Androl. 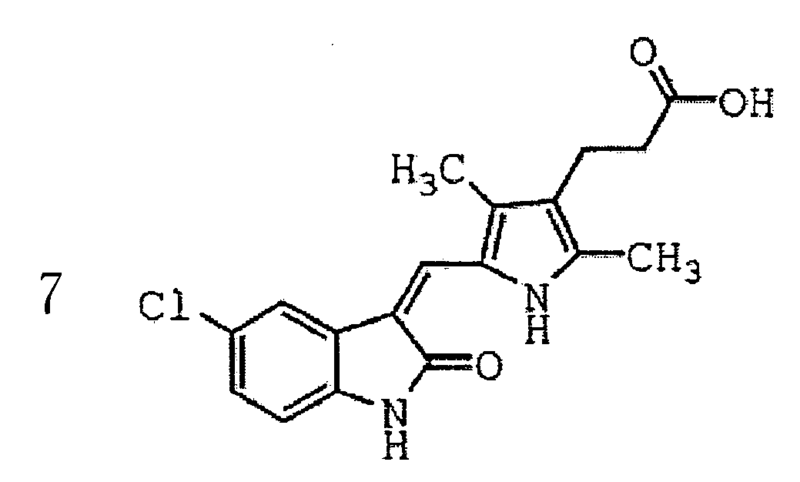 17:85-92; Izquierdo, et al., 1995, J. Pathol. 177:253-258; Strohmeyer, et al., 1995, J. Urol. 153:511-515; Bokenmeyer, et al., 1996, J. Cance. Res. Clin. Oncol. 122:301-306; Sandlow, et al., 1996, J. Androl. 17:403-408). Therefore, inhibition of c-kit kinase will provide a valuable new means for treating these disorders. CNS cancers: SCF and c-kit are expressed throughout the CNS of developing rodents, and the pattern of expression suggests a role in growth, migration and differentiation of neuroectodermal cells. Expression of both receptor and ligand have also been reported in the adult brain (Hamel, et al., 1997, J. Neuro-Onc. 35:327-333). Expression of c-kit has also been observed in normal human brain tissue (Tada, et al. 1994, J. Neuro 80:1063-1073). Glioblastoma and astrocytoma, which define the majority of intracranial tumors, arise from neoplastic transformation of astrocytes (Levin, et al., 1997, Principles & Practice of Oncology:2022-2082). Expression of c-kit has been observed in glioblastoma cell lines and tissues (Berdel, et al., 1992, Canc. Res. 52:3498-3502; Tada, et al. 1994, J. Neuro 80:1063-1073; Stanulla, et al., 1995, Act Neuropath 89:158-165). The association of c-kit with astrocytoma pathology is less clear. 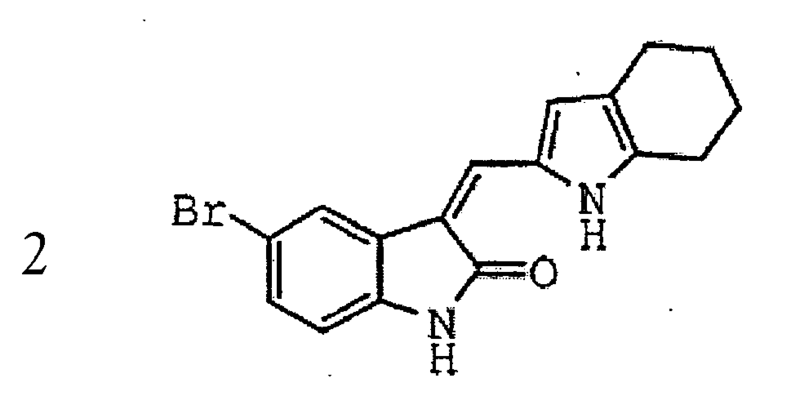 Reports of expression of c-kit in normal astrocytes have been made (Natali, et al., 1992, Int. J. Canc. 52:197-201), (Tada, et al. 1994, J. Neuro 80:1063-1073), while others report it is not expressed (Kristt, et al., 1993, Neuro. 33:106-115). In the latter case, high levels of c-kit expression in high grade tumors were observed (Kristt, et al., 1993, Neuro. 33:106-115), while the former groups were unable to detect any expression in astrocytomas. In addition, contradictory reports of c-kit and SCF expression in neuroblastomas also exist. One study found that neuroblastoma cell lines often express SCF, but rarely express c-kit. In primary tumors, c-kit was detected in about 8% of neuroblastomas, while SCF was found in 18% of tumors (Beck, et al., 1995, Blood 86:3132-3138). In contrast, other studies (Cohen, et al., 1994, Blood 84:3465-3472) have reported that all 14 neuroblastoma cell lines examined contained c-kit/SCF autocrine loops, and expression of both the receptor and ligand were observed in 45% of tumor samples examined. In two cell lines, anti- c-kit antibodies inhibited cell proliferation, suggesting that the SCF/c-kit autocrine loop contributed to growth (Cohen, et al., 1994, Blood 84:3465-3472). Hence, c-kit kinase inhibitors will prove therapeutically useful as a means to treat these cancers. b. Target Mast Cell Diseases Involving c-kit Kinase and/or SCF to be Treated/Prevented by the Present Invention. Mastocytosis: As mentioned above, SCF (also known as mast cell growth factor) stimulation of c-kit has been reported to be essential for the growth and development of mast cells (Hamel, et al., 1997, J. Neuro-Onc. 35:327-333; Kitamura, et al., 1995, Int. Arch. Aller. Immunol. 107:54-56). Mice with mutations of c-kit that attenuate its signaling activity have exhibited significantly fewer mast cells in their skin (Tsujimura, 1996, Pathol Int 46:933-938). Excessive activation of c-kit might be associated with diseases resulting from an over abundance of mast cells. Mastocytosis is the term used to describe a heterogeneous series of disorders characterized by excessive mast cell proliferation (Metcalfe, 1991, J. Invest. Derm 93:2S-4S; Valent; 1996; Golkar, et al., 1997, Lancet 349:1379-1385). Mastocytosis is limited to the skin in the majority of patients, but can involve other organs in 15-20% of patients (Valent, 1996, Wein/Klin Wochenschr 108:385-397; Golkar, et al., 1997, Lancet 349:1379-1385). Even among patients with systemic mastocytosis, the disease can range from having a relatively benign prognosis to aggressive mastocytosis and mast cell leukemia. (Valent, 1996, Wein/Klin Wochenschr 108:385-397; Golkar, et al., 1997, Lancet 349:1379-1385). c-kit has been observed on malignant mast cells from canine mast cell tumors (London, et al., 1996, J. Compar. Pathol. 115:399-414), as well as on mast cells from patients with aggressive systemic mastocytosis (Baghestanian, et al., 1996, Leuk:116-122; Castells, et al., 1996, J. Aller. Clin. Immunol. 98:831-840). Elevated c-kit expression was reported on mast cells from patients with aggressive mastocytosis, but not on mast cells from patients with indolent mastocytosis (Nagata, et al., 1998, Mastocytosis Leuk 12:175-181). SCF has been shown to be expressed on stromal cells as a membrane-bound protein, and its expression can be induced by fibrogenic growth factors such as PDGF (Hiragun, et al. 1998). It has also been shown to be expressed on keratinocytes as a membrane-bound protein in normal skin. However, in the skin of patients with mastocytosis, an increased amount of soluble SCF has been observed (Longley, et al., 1993, New Engl. J. Med. 328:1302-1307). Mast cell chymase has been reported to cleave membrane-associated SCF to a soluble and biologically active form. This mast cell-mediated process could serve to generate a feedback loop to enhance mast cell proliferation and function (Longley, et al., 1997, Proc. Natl. Acad. Sci. 94:9017-9021), and may be important for the etiology of mastocytosis. Transgenic mice overexpressing a form of SCF that could not be proteolytically released from keratinocytes did not develop mastocytosis, while similar animals expressing normal SCF in keratinocytes exhibited a phenotype resembling human cutaneous mastocytosis (Kunisada, et al., 1998, J. Exp. Med. 187:1565-1573). Formation of large amounts of soluble SCF can contribute to the pathology associated with mastocytosis in some patients and the present invention can treat or prevent such disorders by modulating the interaction between SCF and c-kit kinase. Several different mutations of the c-kit RTK that resulted in constitutive kinase activity have been found in human and rodent mast cell tumor cell lines (Furitsu, et al., 1993, J. Clin. Invest. 92:1736-1744; Tsujimura, et al., 1994, Blood 9:2619-2626; Tsujimura, et al., 1995, Int. Arch. Aller. Immunol 106:377-385; Tsujimura, 1996, Pathol Int 46:933-938). In addition, activating mutations of the c-kit gene have been observed in peripheral mononuclear cells isolated from patients with mastocytosis and associated hematologic disorders (Nagata, et al., 1998, Mastocytosis Leuk 12:175-181), and in mast cells from a patient with urticaria pigmentosa and aggressive mastocytosis (Longley, et al., 1996, Nat. Gen. 12:312-314). Inhibition of c-kit kinase will therefore prove to have an excellent therapeutic role in the treatment of these disorders. In some patients, activating mutations of the c-kit RTK may be responsible for the pathogenesis of the disease and these patients can be treated, or their diseases prevented, by modulation of the SCF interaction with c-kit kinase. SCF activation of c-kit as been shown to prevent mast cell apoptosis which may be critical for maintaining cutaneous mast cell homeostasis (Iemura, et al., 1994, Amer. J. Pathol 144:321-328; Yee, et al., 1994, J. Exp. Med. 179:1777-1787; Mekori, et al., 1994, J. Immunol 153:2194-2203; Mekori, et al., 1995, Int. Arch. Allergy Immunol. 107:137-138). Inhibition of mast cell apoptosis could lead to the mast cell accumulation associated with mastocytosis. Thus, observation of c-kit activation resulting from overexpression of the receptor, excessive formation of soluble SCF, or mutations of the c-kit gene that constitutively activate its kinase, provides a rationale that inhibition of the kinase activity of c-kit will decrease the number of mast cells and provide benefit for patients with mastocytosis. Asthma & Allergy: Mast cells and eosinophils represent key cells in parasitic infection, allergy, inflammation, and asthma (Thomas, et al., 1996, Gen. Pharmacol 27:593-597; Metcalfe, et al., 1997, Physiol Rev 77:1033-1079; Holgate, 1997, CIBA Found. Symp. ; Naclerio, et al., 1997, JAMA 278:1842-1848; Costa, et al., 1997, JAMA 278:1815-1822). SCF has been shown to be essential for mast cell development, survival and growth (Kitamura, et al., 1995, Int. Arch. Aller. Immunol. 107:54-56; Metcalfe, et al., 1997, Physiol Rev 77:1033-1079). In addition, SCF cooperates with the eosinophil-specific regulator, IL-5, to increase the development of eosinophil progenitors (Metcalf, et al., 1998, Proc. Natl. Acad. Sci., USA 95:6408-6412). SCF has also been reported to induce mast cells to secrete factors (Okayama, et al., 1997, Int.Arch. Aller. Immunol. 114:75-77; Okayama, et al., 1998, Eur. J. Immunol. 28:708-715) that promote the survival of eosinophils (Kay, et al., 1997, Int. Arch. Aller. Immunol. 113:196-199), which may contribute to chronic, eosinophil-mediated inflammation (Okayama, et al., 1997, Int. Arch. Aller. Immunol. 114:75-77; Okayama, et al., 1998, Eur. J. Immunol. 28:708-715). In this regard, SCF directly and indirectly regulates activation of both mast cells and eosinophils. SCF induces mediator release from mast cells, as well as priming these cells for IgE-induced degranulation (Columbo, et al., 1992, J. Immunol 149:599-602) and sensitizing their responsiveness to eosinophil-derived granule major basic protein (Furuta, et al., 1998, Blood 92:1055-1061). Among the factors released by activated mast cells are IL-5, GM-CSF and TNF-α, which influence eosinophil protein secretion (Okayama, et al., 1997, Int. Arch. Aller. Immunol. 114:75-77; Okayama, et al., 1998, Eur. J. Immunol. 28:708-715). In addition to inducing histamine release from mast cells (Luckacs, et al., 1996, J. Immunol. 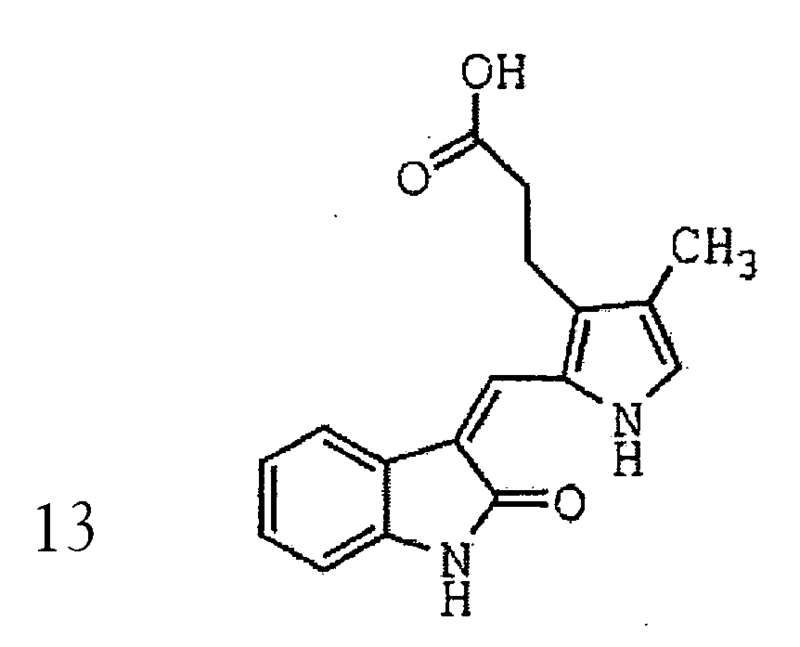 156:3945-3951; Hogaboam, et al., 1998, J. Immunol. 160:6166-6171), SCF promotes the mast cell production of the eosinophil chemotactic factor, eotaxin (Hogaboam, et al., 1998, J. Immunol. 160:6166-6171), and eosinophil infiltration (Luckacs, et al., 1996, J. Immunol. 156:3945-3951). SCF also directly influences the adhesion of both mast cells (Dastych, et al., 1994, J. Immunol. 152:213-219; Kinashi, et al., 1994, Blood 83:1033-1038) and eosinophils (Yuan, et al., 1997, J. Exp. Med. 186:313-323), which in turn, regulates tissue infiltration. Thus, SCF can influence the primary cells involved in allergy and asthma through multiple mechanisms. Currently, corticosteroids are the most effective treatment for chronic rhinitis and inflammation associated with allergy (Naclerio, et al., 1997, JAMA 278:1842-1848; Meltzer, 1997, Aller. 52:33-40). These agents work through multiple mechanisms including reduction of circulating and infiltrating mast cells and eosinophils, and diminished survival of eosinophils associated with inhibition of cytokine production (Meltzer, 1997, Aller, 52:33-40). Steroids have also been reported to inhibit the expression of SCF by fibroblasts and resident connective tissue cells, which leads to diminished mast cell survival (Finotto, et al., 1997, J. Clin. Invest. 99 1721-1728). Because of the mutual regulation of mast cell and eosinophil function, and the role that SCF can play in this regulation, inhibition of c-kit kinase will provide a means to treat allergy-associated chronic rhinitis, inflammation and asthma. In view of the deduced importance ofRTKs in the control, regulation and modulation of endothelial cell proliferation and potentially carcinogenesis, many attempts have been made to identify RTK "inhibitors" using a variety of approaches. 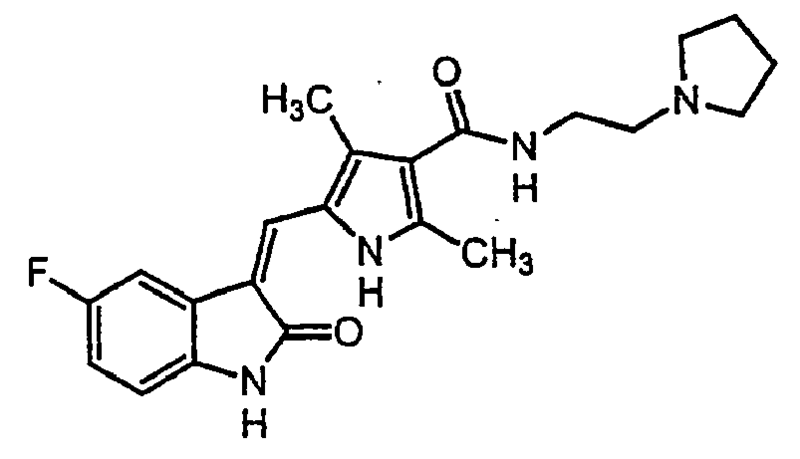 These include the use of mutant ligands (U.S. Patent No. 4,966,849); soluble receptors and antibodies (Application No. WO 94/10202; Kendall and Thomas, 1994, Proc. Natl. Acad. Sci. 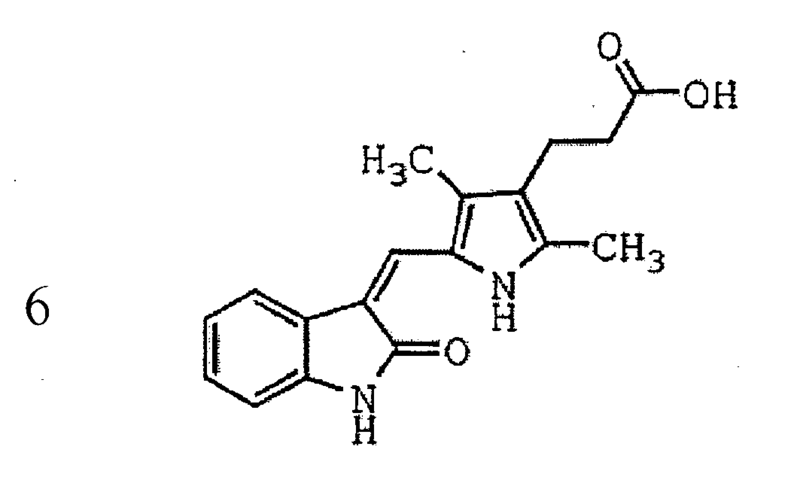 USA 90:10705-10709; Kim, et al., 1993, Nature 362:841-844); and RNA ligands (Jellinek, et al., 1994, Biochemistry 33:10450-10456). 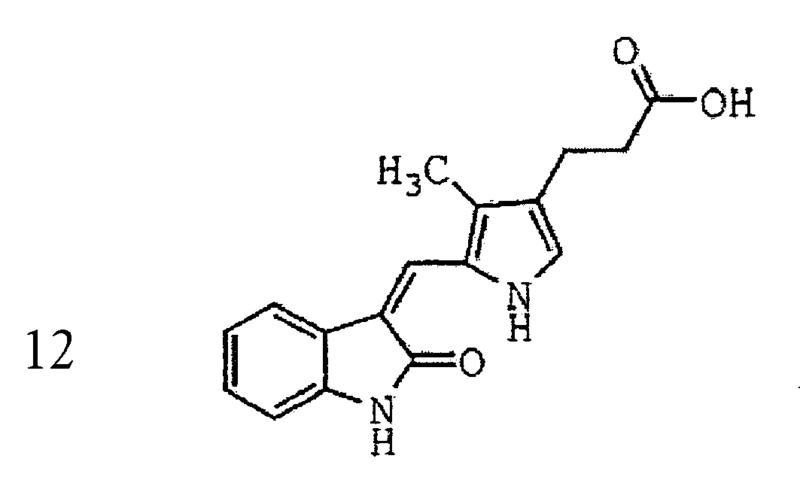 Furthermore, kinase inhibitors (WO 94/03427; WO 92/21660; WO 91/15495; WO 94/14808; U.S. Patent No. 5,330,992; Mariani, et al., 1994, Proc. Am. Assoc. Cancer Res. 35:2268), and inhibitors acting on receptor kinase signal transduction pathways, such as protein kinase C inhibitors have been identified (Schuchter, et al., 1991, Cancer Res. 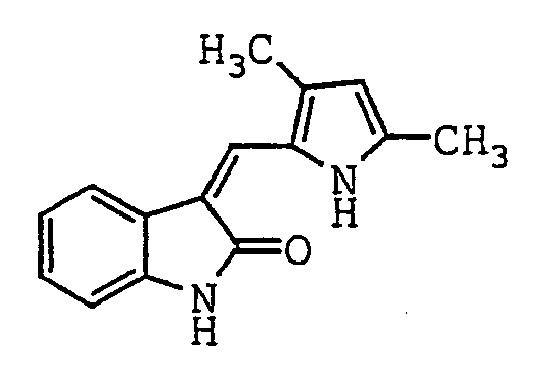 51:682-687); Takano, et al., 1993, Mol. Bio. Cell 4:358A; Kinsella, et al., 1992, Exp. Cell Res. 199:56-62; Wright, et al., 1992, J. Cellular Phys. 152:448-57). More recently, attempts have been made to identify small molecules which act as kinase inhibitors for use in the treatment of cancer. Consequently, there is an unmet need for the identification and generation of effective small compounds which selectively inhibit the signal transduction of the c-kit RTK in order to effectively and specifically suppress this autocrine loop. Some of the compounds used in the present invention demonstrate excellent activity in biological assays and thus these compounds and related compounds are expected to be effective in treating c-kit RTK-related disorders such as those described above. Additionally, the assays and conditions described herein can be utilized to identify further modulators of c-kit kinase functions. The indolinone compounds used in the present invention were tested for their ability to inhibit most of protein kinase activity. The biological assays and results of these inhibition studies are reported herein. The methods used to measure indolinone compound modulation of protein kinase function are similar to those described in International Publication No. WO 98/07695, published March 26, 1998, by Tang et al., and entitled "INDOLINONE COMBINATORIAL LIBRARIES AND RELATED PRODUCTS AND METHODS FOR THE TREATMENT OF DISEASE," and U.S. Patent No. 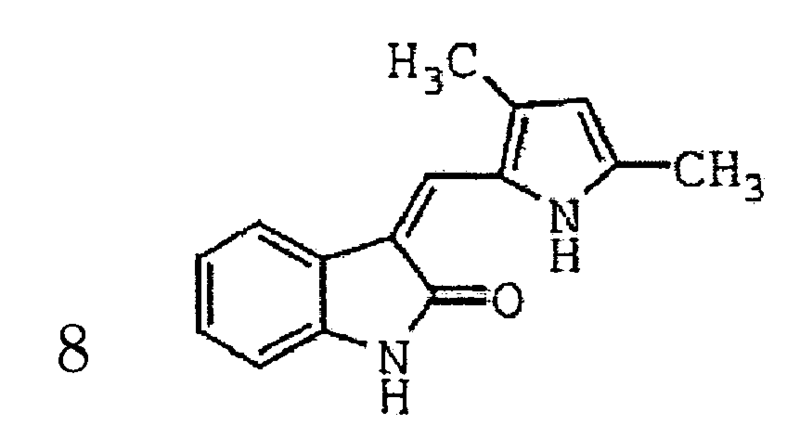 5,792,783, issued August 11, 1998 by Tang et al., entitled 3-HETEROARYL-2-INDOLINONE COMPOUNDS FOR THE TREATMENT OF DISEASE with respect to the high throughput aspect of the method. The compounds described herein can be administered to a human patient per se, or in pharmaceutical compositions where they are mixed with other active ingredients, as in combination therapy, or suitable carriers or excipient(s). Techniques for formulation and administration of the compounds of the instant application may be found in "Remington's Pharmaceutical Sciences," Mack Publishing Co., Easton, PA, latest edition. Suitable routes of administration may, for example, include oral, rectal, transmucosal, or intestinal administration; parenteral delivery, including intramuscular, subcutaneous, intravenous, intramedullary injections, as well as intrathecal, direct intraventricular, intraperitoneal, intranasal, or intraocular injections. Alternately, one may administer the compound in a local rather than systemic manner, for example, via injection of the compound directly into a solid tumor, often in a depot or sustained release formulation. Furthermore, one may administer the drug in a targeted drug delivery system, for example, in a liposome coated with tumor-specific antibody. The liposomes will be targeted to and taken up selectively by the tumor. The pharmaceutical compositions of the present invention may be manufactured in a manner that is itself known, e.g., by means of conventional mixing, dissolving, granulating, dragee-making, levigating, emulsifying, encapsulating, entrapping or lyophilizing processes. Pharmaceutical compositions for use in accordance with the present invention thus may be formulated in conventional manner using one or more physiologically acceptable carriers comprising excipients and auxiliaries which facilitate processing of the active compounds into preparations which can be used pharmaceutically. Proper formulation is dependent upon the route of administration chosen. For injection, the agents of the invention may be formulated in aqueous solutions, preferably in physiologically compatible buffers such as Hanks's solution, Ringer's solution, or physiological saline buffer. For transmucosal administration, penetrants appropriate to the barrier to be permeated are used in the formulation. Such penetrants are generally known in the art. For oral administration, the compounds can be formulated readily by combining the active compounds with pharmaceutically acceptable carriers well known in the art. Such carriers enable the compounds of the invention to be formulated as tablets, pills, dragees, capsules, liquids, gels, syrups, slurries, suspensions and the like, for oral ingestion by a patient to be treated. Pharmaceutical preparations for oral use can be obtained by mixing one or more solid excipients with one or more compounds of the invention, optionally grinding the resulting mixture, and processing the mixture of granules, after adding suitable auxiliaries, if desired, to obtain tablets or dragee cores. Suitable excipients are, in particular, fillers such as sugars, including lactose, sucrose, mannitol, or sorbitol; cellulose preparations such as, for example, maize starch, wheat starch, rice starch, potato starch, gelatin, gum tragacanth, methyl cellulose, hydroxypropylmethyl-cellulose, sodium carboxymethylcellulose, and/or polyvinylpyrrolidone (PVP). If desired, disintegrating agents may be added, such as the cross-linked polyvinyl pyrrolidone, agar, or alginic acid or a salt thereof such as sodium alginate. Dragee cores are provided with suitable coatings. For this purpose, concentrated sugar solutions may be used, which may optionally contain gum arabic, talc, polyvinyl pyrrolidone, carbopol gel, polyethylene glycol, and/or titanium dioxide, lacquer solutions, and suitable organic solvents or solvent mixtures. Dyestuffs or pigments may be added to the tablets or dragee coatings for identification or to characterize different combinations of active compound doses. Pharmaceutical preparations which can be used orally include push-fit capsules made of gelatin, as well as soft, sealed capsules made of gelatin and a plasticizer, such as glycerol or sorbitol. The push-fit capsules can contain the active ingredients in admixture with fillers such as lactose, binders such as starches, and/or lubricants such as talc or magnesium stearate and, optionally, stabilizers. In soft capsules, the active compounds may be dissolved or suspended in suitable liquids, such as fatty oils, liquid paraffin, or liquid polyethylene glycols. In addition, stabilizers may be added. All formulations for oral administration should be in dosages suitable for such administration. For administration by inhalation, the compounds for use according to the present invention are conveniently delivered in the form of an aerosol spray presentation from pressurized packs or a nebuliser, with the use of a suitable propellant, e.g., dichlorodifluoromethane, trichlorofluoromethane, dichlorotetrafluoroethane, carbon dioxide or other suitable gas. In the case of a pressurized aerosol the dosage unit may be determined by providing a valve to deliver a metered amount. Capsules and cartridges of, e.g., gelatin for use in an inhaler or insufflator may be formulated containing a powder mix of the compound and a suitable powder base such as lactose or starch. The compounds may be formulated for parenteral administration by injection, e.g., by bolus injection or continuous infusion. Formulations for injection may be presented in unit dosage form, e.g., in ampoules or in multi-dose containers, with an added preservative. The compositions may take such forms as suspensions, solutions or emulsions in oily or aqueous vehicles, and may contain formulatory agents such as suspending, stabilizing and/or dispersing agents. Pharmaceutical formulations for parenteral administration include aqueous solutions of the active compounds in water-soluble form. Additionally, suspensions of the active compounds may be prepared as appropriate oily injection suspensions. Suitable lipophilic solvents or vehicles include fatty oils such as sesame oil, or synthetic fatty acid esters, such as ethyl oleate or triglycerides, or liposomes. Aqueous injection suspensions may contain substances which increase the viscosity of the suspension, such as sodium carboxymethyl cellulose, sorbitol, or dextran. Optionally, the suspension may also contain suitable stabilizers or agents which increase the solubility of the compounds to allow for the preparation of highly concentrated solutions. Alternatively, the active ingredient may be in powder form for constitution with a suitable vehicle, e.g., sterile pyrogen-free water, before use. The compounds may also be formulated in rectal compositions such as suppositories or retention enemas, e.g., containing conventional suppository bases such as cocoa butter or other glycerides. In addition to the formulations described previously, the compounds may also be formulated as a depot preparation. Such long acting formulations may be administered by implantation (for example subcutaneously or intramuscularly) or by intramuscular injection. Thus, for example, the compounds may be formulated with suitable polymeric or hydrophobic materials (for example as an emulsion in an acceptable oil) or ion exchange resins, or as sparingly soluble derivatives, for example, as a sparingly soluble salt. A pharmaceutical carrier for the hydrophobic compounds of the invention is a cosolvent system comprising benzyl alcohol, a nonpolar surfactant, a water-miscible organic polymer, and an aqueous phase. The cosolvent system may be the VPD co-solvent system. VPD is a solution of 3% w/v benzyl alcohol, 8% w/v of the nonpolar surfactant Polysorbate 80, and 65% w/v polyethylene glycol 300, made up to volume in absolute ethanol. The VPD co-solvent system (VPD:D5W) consists of VPD diluted 1:1 with a 5% dextrose in water solution. This co-solvent system dissolves hydrophobic compounds well, and itself produces low toxicity upon systemic administration. Naturally, the proportions of a co-solvent system may be varied considerably without destroying its solubility and toxicity characteristics. Furthermore, the identity of the co-solvent components may be varied: for example, other low-toxicity nonpolar surfactants may be used instead of Polysorbate 80; the fraction size of polyethylene glycol may be varied; other biocompatible polymers may replace polyethylene glycol, e.g., polyvinyl pyrrolidone; and other sugars or polysaccharides may substitute for dextrose. Alternatively, other delivery systems for hydrophobic pharmaceutical compounds may be employed. Liposomes and emulsions are well known examples of delivery vehicles or carriers for hydrophobic drugs. Certain organic solvents such as dimethylsulfoxide also may be employed, although usually at the cost of greater toxicity. Additionally, the compounds may be delivered using a sustained-release system, such as semipermeable matrices of solid hydrophobic polymers containing the therapeutic agent. Various sustained-release materials have been established and are well known by those skilled in the art. Sustained-release capsules may, depending on their chemical nature, release the compounds for a few weeks up to over 100 days. Depending on the chemical nature and the biological stability of the therapeutic reagent, additional strategies for protein stabilization may be employed. Many of the PTK modulating compounds of the invention may be provided as salts with pharmaceutically compatible counterions. Pharmaceutically compatible salts may be formed with many acids, including but not limited to hydrochloric, sulfuric, acetic, lactic, tartaric, malic, succinic, etc. Salts tend to be more soluble in aqueous or other protonic solvents than are the corresponding free base forms. Pharmaceutical compositions suitable for use in the present invention include compositions where the active ingredients are contained in an amount effective to achieve its intended purpose. More specifically, a therapeutically effective amount means an amount of compound effective to prevent, alleviate or ameliorate symptoms of disease or prolong the survival of the subject being treated. Determination of a therapeutically effective amount is well within the capability of those skilled in the art, especially in light of the detailed disclosure provided herein. For any compound used in the methods of the invention, the therapeutically effective dose can be estimated initially from cell culture assays. For example, a dose can be formulated in animal models to achieve a circulating concentration range that includes the IC50 as determined in cell culture (i.e., the concentration of the test compound which achieves a half-maximal inhibition of the PTK activity). Such information can be used to more accurately determine useful doses in humans. Toxicity and therapeutic efficacy of the compounds described herein can be determined by standard pharmaceutical procedures in cell cultures or experimental animals, e.g., for determining the LD50 (the dose lethal to 50% of the population) and the ED50 (the dose therapeutically effective in 50% of the population). The dose ratio between toxic and therapeutic effects is the therapeutic index and it can be expressed as the ratio between LD50 and ED50. Compounds which exhibit high therapeutic indices are preferred. The data obtained from these cell culture assays and animal studies can be used in formulating a range of dosage for use in human. The dosage of such compounds lies preferably within a range of circulating concentrations that include the ED50 with little or no toxicity. The dosage may vary within this range depending upon the dosage form employed and the route of administration utilized. The exact formulation, route of administration and dosage can be chosen by the individual physician in view of the patient's condition. 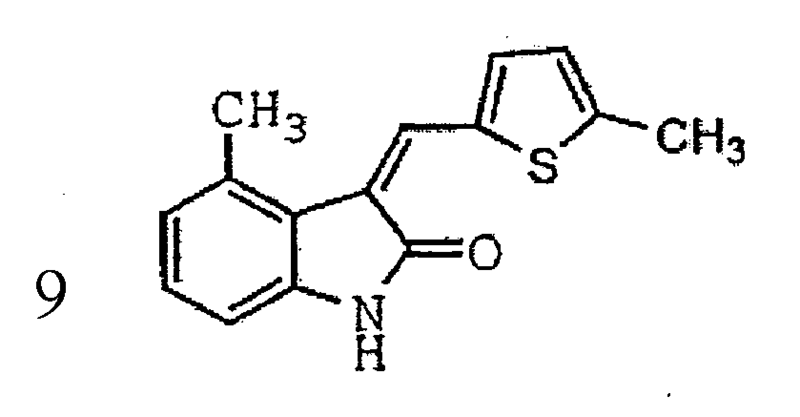 (See e.g., Fingl, et al., 1975, in "The Pharmacological Basis of Therapeutics", Ch. 1 p.1). Dosage amount and interval may be adjusted individually to provide plasma levels of the active moiety which are sufficient to maintain the kinase modulating effects, or minimal effective concentration (MEC). The MEC will vary for each compound but can be estimated from in vitro data; e.g., the concentration necessary to achieve 50-90% inhibition of the kinase using the assays described herein. Dosages necessary to achieve the MEC will depend on individual characteristics and route of administration. However, HPLC assays or bioassays can be used to determine plasma concentrations. Dosage intervals can also be determined using MEC value. Compounds should be administered using a regimen which maintains plasma levels above the MEC for 10-90% of the time, preferably between 30-90% and most preferably between 50-90%. In cases of local administration or selective uptake, the effective local concentration of the drug may not be related to plasma concentration. The amount of composition administered will, of course, be dependent on the subject being treated, on the subject's weight, the severity of the affliction, the manner of administration and the judgment of the prescribing physician. The compositions may, if desired, be presented in a pack or dispenser device which may contain one or more unit dosage forms containing the active ingredient. The pack may for example comprise metal or plastic foil, such as a blister pack. The pack or dispenser device may be accompanied by instructions for administration. The pack or dispenser may also be accompanied with a notice associated with the container in form prescribed by a governmental agency regulating the manufacture, use, or sale of pharmaceuticals, which notice is reflective of approval by the agency of the form of the compound for human or veterinary administration. Such notice, for example, may be the labeling approved by the U.S. Food and Drug Administration for prescription drugs, or the approved product insert. Compositions comprising a compound of the invention formulated in a compatible pharmaceutical carrier may also be prepared, placed in an appropriate container, and labeled for treatment of an indicated condition. Suitable conditions indicated on the label may include treatment of a tumor, inhibition of angiogenesis, treatment of fibrosis and diabetes. Additional methods of preparing pharmaceutical formulations of the compounds, methods of determining the amounts of compounds to be administered to a patient, and modes of administering compounds to an organism are disclosed in U.S. Application Serial No. 08/702,232 by Tang, et al., and entitled "Indolinone Combinatorial Libraries and Related Products and Methods for the Treatment of Disease," filed August 23, 1996, and International patent publication number WO 96/22976, by Buzzetti, et al., and entitled "Hydrosoluble 3-Arylidene-2-Oxindole Derivatives as Tyrosine Kinase Inhibitors," published August 1, 1996. Those skilled in the art will appreciate that such descriptions are applicable to the present invention and can be easily adapted to it. The examples below are representative of various aspects and features of the present invention. The examples describe methods for synthesizing compounds of the invention and methods for measuring an effect of a compound on the function of protein kinases. The cells used in the methods are available commercially or from academic labs or were engineered from commercially available cells. The nucleic acid vectors harbored by the cells are also commercially available and the sequences of genes for the various protein kinases are readily accessible in sequence data banks. Thus, a person of ordinary skill in the art can readily recreate the cell lines in a timely manner by combining the commercially available cells, the commercially available nucleic acid vectors, and the protein kinase genes using techniques readily available to persons of ordinary skill in the art. The following in vitro assays may be used to determine the level of activity and effect of the different compounds of the present invention on one or more of the PKs. Similar assays can be designed along the same lines for any PK using techniques well known in the art. The cellular/catalytic assays described herein are performed in an ELISA format. The general procedure is a follows: a compound is introduced to cells expressing the test kinase, either naturally or recombinantly, for some period of time after which, if the test kinase is a receptor, a ligand known to activate the receptor is added. The cells are lysed and the lysate is transferred to the wells of an ELISA plate previously coated with a specific antibody recognizing the substrate of the enzymatic phosphorylation reaction. Non-substrate components of the cell lysate are washed away and the amount of phosphorylation on the substrate is detected with an antibody specifically recognizing phosphotyrosine compared with control cells that were not contacted with a test compound. The assay could also be adapted to detection by Western blotting. The cellular/biologic assays described herein measure the amount of DNA made in response to activation of a test kinase, which is a general measure of a proliferative response. The general procedure for this assay is as-follows: a compound is introduced to cells expressing the test kinase, either naturally or recombinantly, for some period of time after which, if the test kinase is a receptor, a ligand known to activate the receptor is added. After incubation at least overnight, a DNA labeling reagent such as bromodeoxy-uridine (BrdU) or 3H-thymidine is added. The amount of labeled DNA is detected with either an anti-BrdU antibody or by measuring radioactivity and is compared to control cells not contacted with a test compound. Enzyme linked immunosorbent assays (ELISA) may be used to detect and measure the presence of PK activity. The ELISA may be conducted according to known protocols which are described in, for example, Voller, et al., 1980, "Enzyme-Linked Immunosorbent Assay," In: Manual of Clinical Immunology, 2d ed., edited by Rose and Friedman, pp. 359-371 Am. Soc. Of Microbiology, Washington, D.C. The disclosed protocol may be adapted for determining activity with respect to a specific PK, such as c-kit kinase. The preferred protocols for conducting the ELISA experiments for the specific PKs, c-kit kinase, is provided below. Adaptation of these protocols for determining a compound's activity for other members of the RTK family, as well as for CTKs and STKs, is well within the scope of knowledge of those skilled in the art. The biochemical activity of some of the compounds of the invention were tested using the assays described. The IC50 values were measured for several of the compounds of the invention. The results are shown in Figure 2. 1) HNTG: 5X stock concentration: 100 mM HEPES pH 7.2, 750 mM NaCl, 50% glycerol, 2.5% Triton X-100. 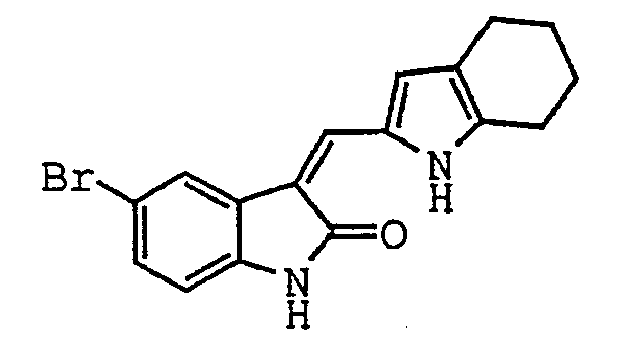 4) 1 X Kinase Buffer: 25 mM HEPES, 100 mM NaCl, 10 mM Mg Cl2, 6 mM Mn Cl2. 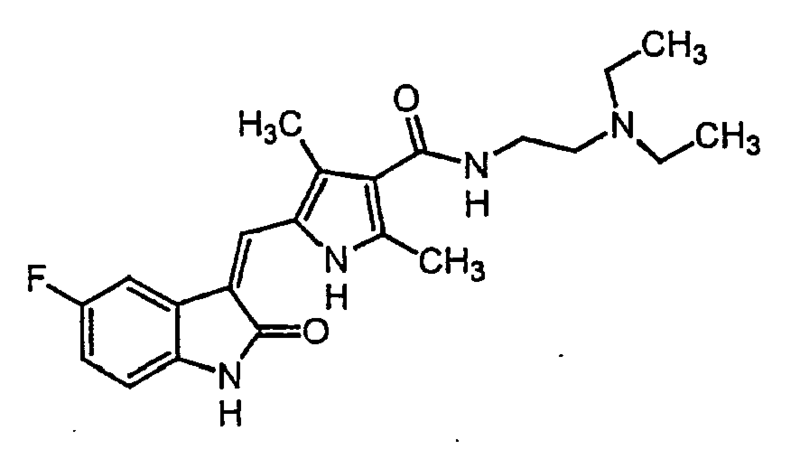 6) 10 mM ATP (Bacterial source) Sigma A-7699, 5g. 18) TBST Buffer: 50 mM Tris pH 7.2, 150 mM NaCl, 0.1% Triton X-100. 19) Goat affinity purified antibody Rabbit IgG (whole molecule): Cappel 55641. 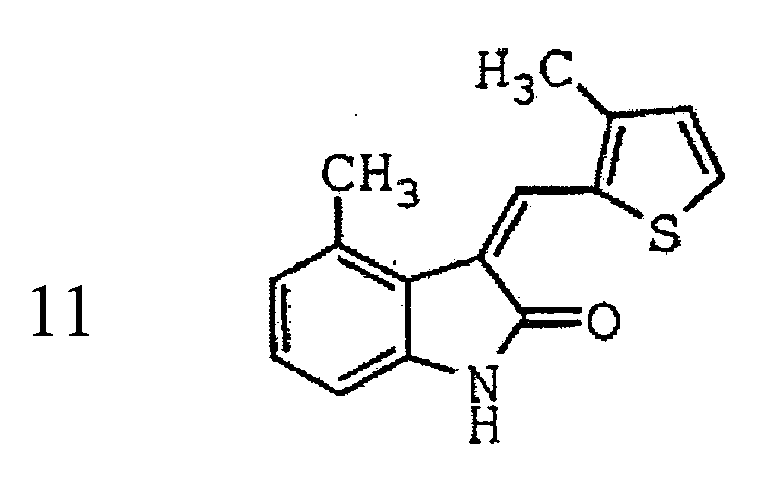 22) Indolinone Compounds: The indolinone compounds were synthesized as set forth in the following application: PCT application number US99/06468, filed March 26, 1999 by Fong, et al. and entitled METHODS OF MODULATING TYROSINE PROTEIN KINASE (Lyon & Lyon docket number 231/250 PCT. All of the following steps are conducted at room temperature unless it is specifically indicated. All ELISA plate washing is by rinsing 4x with TBST. This procedure is performed 1hour prior to the start of receptor capture. 1) Wash a >95% confluent 15 cm dish with PBS and aspirate as much as possible. 2) Lyse the cells with 3 ml of 1x HNTG containing 1 mM PMSF/15 cm dish. Scrape the cells from the plate and transfer to a 50 ml centrifuge tube. 3) Pool supernatants, and allow to sit, on ice, for one hour with occasional vortexing. Failure to do so with result in an increased background (approximately 3-fold higher). 5) Perform protein determination as per the SOP for protein determination using the bicinchoninic acid (BCA) method. 1) Coat Corning 96-well ELISA plates with 2 µg per well Goat anti-rabbit antibody in PBS for a total well volume of 100 µl. Store overnight at 4°C. 2) Remove unbound Goat anti-rabbit antibody by inverting plate to remove liquid. 3) Add 100 µl of Blocking Buffer to each well. Shake at room temperature for 60 min. 5) Add 0.2 µg per well of Rabbit anti -Kit antibody diluted in TBST for a total well volume of 100 µl. Shake at room temperature for 60 min. 7) Add 100 µl of diluted lysate to each well. Shake at room temperature for 60 min. 10) Transfer 100 µl of diluted drug to ELISA plate wells. Incubate at room temperature with shaking for 60min. 11) Stop reaction with the addition of 10 µl of 0.5 M EDTA. Plate is now stable for a reasonable period of time. 13) Add 100 µl per well of UB40 (1:2000 dilution in TBST). Incubate 60 min at room temperature, with shaking. 15) Add 100 µl per well of sheep anti-mouse IgG - HRP (1:5000 dilution in TBST). Incubate 60 min at room temperature, with shaking. 17) Add 100 µl per well of ABTS. Incubate with shaking for 15-30 min. The biochemical activity of two of the compounds of the invention were tested using the assays described below. MO7E cells, a human myeloid leukemia cell line, were maintained in RPMI-1640 medium supplemented with 10% fetal calf serum and 10 ng/ml each IL-3 and GM-CSF. MO7E cells were serum starved overnight in 0.1% serum. Cells were pre-treated with Compound Eight for 2 hours, or with Compound Six for 22 hours (concurrent with serum starvation), prior to ligand stimulation. Cells were stimulated with 250 ng/ml rh-SCF for 15 minutes. Following stimulation, cells were lysed and immunoprecipitated with an anti-c-kit antibody. Phosphotyrosine and protein levels were determined by western blotting. MO7E cells were serum starved and pre-treated with compound as described for the phosphorylation experiments. Cells were plated @ 4X105 cells/well in a 96 well dish, in 100 µl RPMI + 10% serum. rh-SCF (100 ng/mL) was added and the plate was incubated for 48 hours. After 48 hours, 10 µl of 5 mg/ml MTT [3-(4, 5-dimethythiazol-2-yl)-2, 5-diphenyl tetrazolium bromide) was added and allowed to incubate for 4 hours. Acid isopropanol (100 µl of 0.04N HCl in isopropanol) was added and the optical density was measured at a wavelength of 550 nm. MO7E cells were incubated +/- SCF and +/- compound (Compound Six or Compound Eight @ 5 and 25 µM) in 10% FBS with rh-GM-CSF(10ng/mL) and rh-IL-3 (10ng/mL). Samples were assayed at 24 and 48 hours. To measure activated caspase-3, samples were washed with PBS and permeabilized with ice-cold 70% ethanol. The cells were then stained with PE-conjugated polyclonal rabbit anti-active caspase-3 and analyzed by FACS. To measure cleaved PARP, samples were lysed and analyzed by western blotting with an anti-PARP antibody. Compound Eight and Compound Six inhibit tyrosine phosphorylation of c-kit in MO7E cells, a human myeloid leukemia cell line, in response to ligand stimulation with stem cell factor (SCF). In Compound Eight treated cells, no inhibition of phosphorylation was observed at 0.01 µM, partial inhibition was observed at 0.1 µM, and complete inhibition was observed at 1 and 10 µM. In Compound Six treated cells, no inhibition of c-kit tyrosine phosphorylation was observed at 0.01 µM or 0.1 µM, partial inhibition was observed at 1 µM, and complete inhibition was observed at 10 µM. Compound Eight and Compound Six also inhibit c-kit mediated signaling in MO7E cells in an MTT proliferation assay. The IC50 value for Compound Eight inhibition of proliferation is approximately 0.5-1.0 µM, and the IC50 value for Compound Six is approximately 5-7 µM. Compound Eight and Compound Six also induce apoptosis in MO7E cells, in a dose and time dependent fashion. Apoptosis was assessed with two assays: a FACS analysis with an antibody that recognizes activated caspase-3 in cells, which is induced during apoptosis, and a western blotting assay that detects a cleaved fragment of poly (ADP-ribose) polymerase, also induced during apoptosis. Using the caspase-3 assay, an approximately 50% increase in the number of apoptotic cells was observed at 48 hours, upon SCF stimulation and 25µM Compound Eight treatment, compared to untreated SCF stimulated cells. A slight effect was observed at 48 hours with 25 µM Compound Eight in the absence of SCF stimulation. Treatment for 24 hours with 25 µM Compound Eight (+/- SCF stimulation), resulted in a measurable but smaller number of apoptotic cells. Treatment of cells with 5 µM Compound Eight for 24 or 48 hours (+/- SCF stimulation) also resulted in a measurable but smaller number of apoptotic cells. Similar results were obtained for Compound Six, with the exception of no effect observed with 5 µM Compound Six at 24 hours, with or without SCF stimulation. Using the PARP assay, treatment with 25 µM Compound Eight for 48 hours resulted in the greatest increase in the amount of cleaved PARP. The effect was augmented slightly with SCF stimulation. The 24 hour sample treated with 25µM Compound Eight was similar to the 48 hour sample. Treatment with 5 µM Compound Eight , at both timepoints, resulted in a very minimal increase in cleaved PARP. Similar results were obtained for Compound Six. 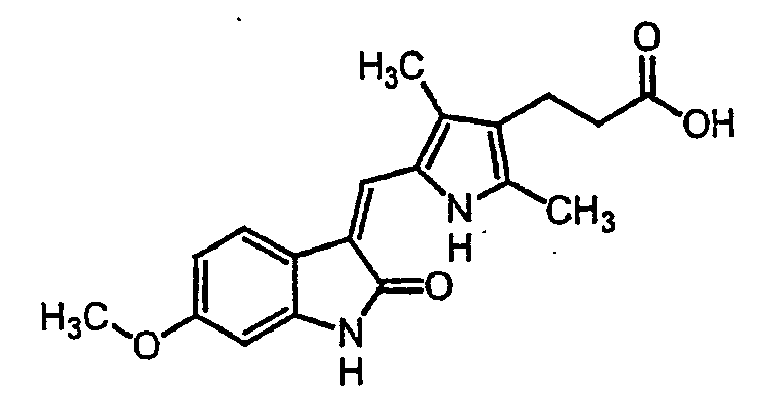 Use of an indolinone compound for preparing a pharmaceutical composition for treating or preventing allergy-associated chronic rhinitis, mastocytosis, the presence of one or more mast cell tumors, or asthma in an organism, said composition comprising a therapeutically effective amount of said indolinone compound being as defined in claim 1. The use of claim 1 or 2, wherein said organism is a mammal. The use of claim 3, wherein said organism is a human. BR112012032462A2 (en) 2010-06-25 2016-11-08 Eisai R&D Man Co Ltd employing compounds antitumor agent, in combination, have kinase inhibitory effect. BR112018005589A2 (en) 2015-09-22 2018-10-09 Graybug Vision Inc "Compound, a pharmaceutically acceptable composition, and use of a compound"
AT114661T (en) 1990-04-02 1994-12-15 Pfizer Benzylphosphonic tyrosine kinase inhibitors. Suda et al. 2009 EGFR T790M mutation: a double role in lung cancer cell survival?